Women who need to dress for the office every day love our Work Wonders Collection, filled with polished separates that coordinate in countless ways to fill your workweek. Choose from pants, skirts and layered tops in neutral colors, with a seasonal selection of prints and accent colors to add pops of interest. Travel a lot? Our Easy Wear Everywhere Collection is easy to pack because everything is comfortable and wrinkle-free. These women's tops and bottoms make it easy to look great no matter where you've been or where you're going. 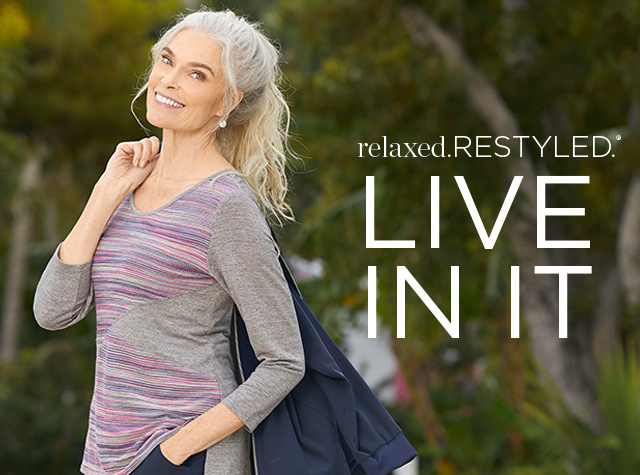 When you're off the clock, reach for loungewear, leisurewear and activewear from our Relaxed. Restyled. Collection. Comfortable knit tops, hoodies, leggings and pants will be your first choice for after work and weekends. Visit Denim Destination, our go-to shop for jeans, jean jackets and all things denim. Here you'll find our signature slimming colored denim or blue denim, with their secret tummy-slimming panel that you're going to love, if you don't already. In short, our Featured Shops are the place to find women's clothing and outfit ideas that focus on the different moods, occasions and destinations that make up your life. Watch this space for new Featured Shops popping up because, just like you, they're always on the move.